The United States paused for a moment of silence to remember the 9/11 attacks on the World Trade Center and the Pentagon. At 8:46 a.m. President Donald Trump and his wife, Melania, emerged from the White House in Washington, D.C. and stood at attention while a bell was rung one time. Following the moment of silence at Ground Zero in New York, family members of the nearly 3,000 people killed 16 years ago began reading out the names of those who died in the attacks. The reading paused shortly after 9 a.m. for a second moment of silence heralded by the ringing of a bell, to mark the time when the second tower was struck. Nearly 3,000 people were killed on Sept. 11, 2011 when two hijacked passenger jets slammed into each of the Twin Towers, or the World Trade Center. Another jet crashed into the Pentagon in Washington, D.C. A fourth plane whose destination is believed to have been the Capitol crashed in a field in Pennsylvania after some of the 33 passengers on board attacked the hijackers. Ceremonies also are to be held at the Pentagon, and at the Flight 93 National Memorial near Shanksville, Pennsylvania. 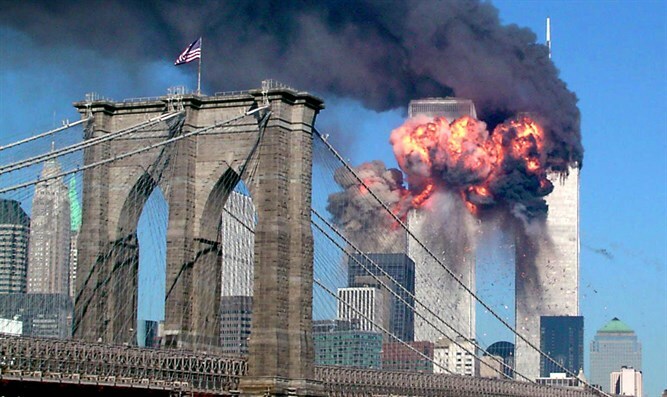 Five Israelis were among the nearly 3,000 victims of the 9/11 attacks. A JNF monument in Arazim Valley near Jerusalem, called the 9/11 Living Memorial, is the only monument outside of the United States that lists the names of all the victims.